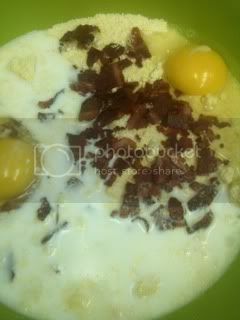 A Teaspoon and A Pinch: Free Turkey Bacon? I recently got a chance to try out Oscar Mayer Turkey Bacon free thanks to being a member of Kraft First Taste - anyone can sign up and every so often there will be a new offer to sign up for...it's a great way to try out Kraft products for free. While shopping for rice this week - My youngest son wanted to know what beans were...he thought that they only came in a can...so I made it my mission to show him how to make them...only I didn't know either. Gasp. Since I didn't give it enough fore thought to soak my beans over night...I picked through them, put them in a pot of water that I brought to a quick boil and let them sit there for an hour...then rinsed and drained them. 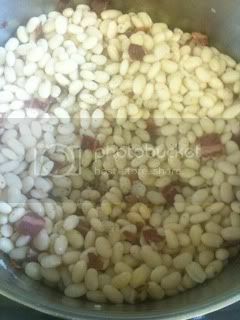 (this was against my Mother's wishes) she said that the skins of the beans would come off - she was right - but only a few did. 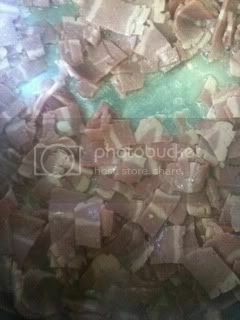 While the beans were draining...I cut up the entire package of turkey bacon into small pieces and fried it in a little bit of canola oil. 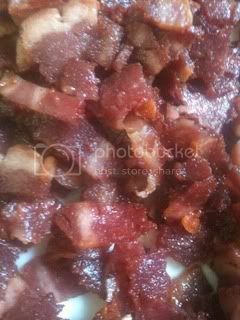 If you have never tried turkey bacon - I would really recommend it! It doesn't taste anything like pork bacon...so you can't really use it to replace bacon - but it does have a good flavor and makes a really mean Turkey BLT. I reserved most of it for topping beans and Jiffy Muffins. Then I put the beans back into the bacon grease and left over bacon, added a full box of chicken stock and a little bit of water. Cook for about an hour and a half at medium heat with the lid slightly offset. 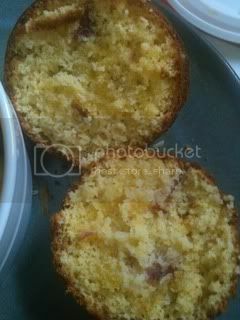 Prepare Jiffy Muffins according to package directions...I just threw in some of the turkey bacon. 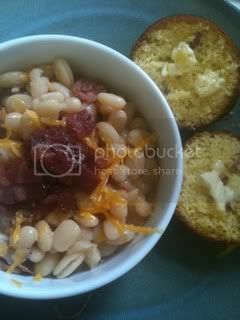 To serve...top bowl of beans with a little bit of cheese and crispy turkey bacon. While this may not seem so TA-DAA - it was a welcome change. It was a recipe that I have never tried...and we loved it. This is definitely a 5 spooner with everyone at my house - Even Hubby who turned his nose up when he figured out what I was making. In fact - he went back for seconds. 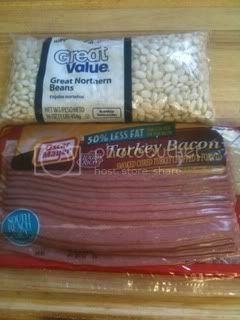 Like I said on your blog..
Yeah for Turkey bacon.. Yummy..
Aren't you nifty putting this all together like that?! Way to go! Summer time really is Salad time.